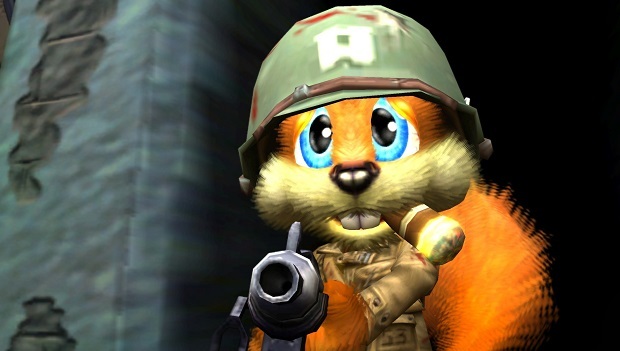 As part of Rare’s new compilation Rare Replay, ex-Rare developer Chris Seavor has spoken a bit about the likelihood of a sequel to Conker’s Bad Fur Day, and how he feels about the game nearly 14 years later. During a making of documentary for the game, Seavor, who acted as director for the original Conker’s Bad Fur Day, explained that he doesn’t believe that there will ever be a similar game to the crude platformer, especially not in this day and age due to the nature of its humor. I probably would change some of the stuff now,” he said. “The obvious one is the sunflower. That whole sequence is like, nope. I couldn’t do that again. “If it was made now and if it was the same team it wouldn’t… I don’t think we’d do a game that people would want because they’d want the original Conker but again,” he continued. “But we’re not the people to make that game, ironically, because we’ve changed. My tastes have changed and I’ve moved on. Conker’s Bad Fur Day was released on the Nintendo 64 in 2001, and was remade for the original Xbox in 2005. While an official sequel may not be in the works, new Conker content was recently released for Project Spark in the form of Conker’s Big Reunion. For more on Conker and Rare, check out Gaming Trend’s review of Rare Replay.